As Bitcoin and other cryptocurrencies gain widespread adoption, many investors have started diversifying one retirement account or more with digital currency holdings. Such an account is a Self-Directed IRA called a Digital IRA. The main decision that an investor needs to make when rolling over some of their retirement savings into a Digital IRA is what type of IRA to choose. There are several “modes” of an IRA (Traditional IRA, Roth IRA, and others) but one for consideration for those who are self-employed (or own a small business) is called an SEP IRA. This article describes what an SEP IRA is and why it is perhaps one of the most attractive options when investing in a Digital IRA for those who qualify. An SEP IRA (or Simplified Employee Pension Individual Retirement Account) allows an employer to contribute funds into their employees’ (and their own) retirement accounts. These contributions are tax-deductible and taxes are not paid on those investments until the employee actually retires (at that point, distributions from the SEP IRA are taxed as income). Mike is a sole proprietor who wants to take advantage of higher annual maximums on IRA contributions that is offered by an SEP IRA. Mike decides to roll over his current Traditional IRA into an SEP IRA. After doing the rollover, Mike has flexibility in determining the size of his IRA contributions in any given year. His contributions are also tax-deductible. Mike makes $200,000 annually and decides to set his annual SEP IRA contribution to $50,000, the maximum for him for that year and income level (and much higher than limits for most other IRA types). Mike can use his SEP IRA even if he works at a second job apart from his own small business. If Mike’s business grows, he will offer the same percentage of compensation for all eligible employees for their own SEP IRAs. Although an employee can determine what types of assets comprise their SEP IRA account, only the employer can decide the amount of annual employer contributions. The employee can decide to invest in digital currency as part of their SEP IRA (more on this later). After contributions are made, the SEP IRA functions almost exactly like a Traditional IRA in terms of investment, distribution, and rollover rules. So what are the benefits of an SEP IRA compared to other IRA types? An SEP IRA is very similar to a Traditional IRA, but the main advantage it has is higher annual contribution limits. An employer (or self-employed person) can contribute whichever is smaller of either (a) $55,000 for 2018, or (b) 25% of compensation. An SEP IRA is easy to set up and operate and also has no filing requirements or reporting requirements, another big plus for employers. If cash flow is an issue for a small business or revenue is cyclical, an SEP IRA is a good plan because annual contributions are flexible. An employee is always 100% vested in all of the money in their SEP IRA, which is not the case with some other retirement accounts. For those who have a self-employed income (or are considering setting up a sole proprietorship and becoming a small business owner or self-employed person), there are many advantages to investing in Bitcoin specifically in a Self-Directed IRA that is also an SEP IRA. received at least $600 (2018) in compensation from the business for the year. Catch-up contributions are not allowed with SEP IRA plans. As described above, a Digital IRA has to be a Self-Directed IRA, which itself can be one of various types. Many investors choose to invest in Bitcoin, Ethereum, and other cryptocurrency in specifically the SEP IRA type because of the various advantages mentioned in this article. Like other types of IRAs, a Self-Directed IRA requires a custodian to manage funds in the retirement account (though the account owner has full control as to how the funds are invested in the SEP IRA). For someone with a business (or for a self-employed person) who wants to invest a greater portion of their retirement savings into Bitcoin, an SEP IRA offers generally higher contribution limits than other types of retirement accounts like Traditional IRAs. BitIRA helps you every step of the way in setting up an SEP IRA with digital currency holdings. 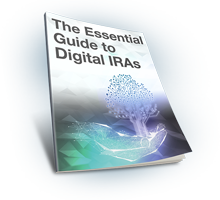 Get your free guide about setting up a Digital IRA today! Monitor the performance of your new Digital IRA in BitIRA’s Customer Web Portal. Diversify Your IRA or 401(k) With Cryptocurrency. Claim Your Free Guide Today! PreviousPrevious post:Blockchain Adoption Boosted by $50-Million Donation from RippleNextNext post:Is Bitcoin Price a Predictor of the Stock Market?